Suppose you want to store some data which you think will be useful throughout your app and you want to save it then NSUserDefualts Class is the most easiest way to save application data and properties. 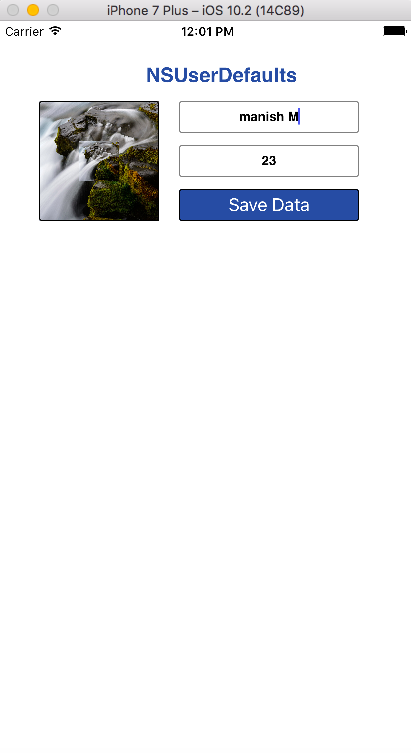 Even if you close your application that saved data will be available to you throughout your app. You might think where this data will be stored . Right ? The objects will be saved in what is known as the iOS "defaults system ". In this example, you will learn how to use NSUserDefaults in Swift. We save string value of name , integer value of age and image in NSUserDefaults for example(say). labelUserDefaults.text = "NSUserDefaults in Swift | iOS App development"
textFieldAge.text =  userDefaults.value(forKey: "age") as! String? textFieldName.text = userDefaults.value(forKey: "name") as! String? Now to get the stored value from NSUserDefaults we used stringForKey method to get name, integerForKey to get age and dataForKey to get imageData. tehn assigned those value to their respective textFields and imageView.